A former senior aide to the 2016 Democratic presidential nominee, Hillary Clinton, said there was a “not zero” chance she could throw her hat in the ring to run for president a third time. After mostly staying out of the political fray since her loss in 2016, Clinton has begun to reemerge – but not everyone in the Democratic Party is happy about it. 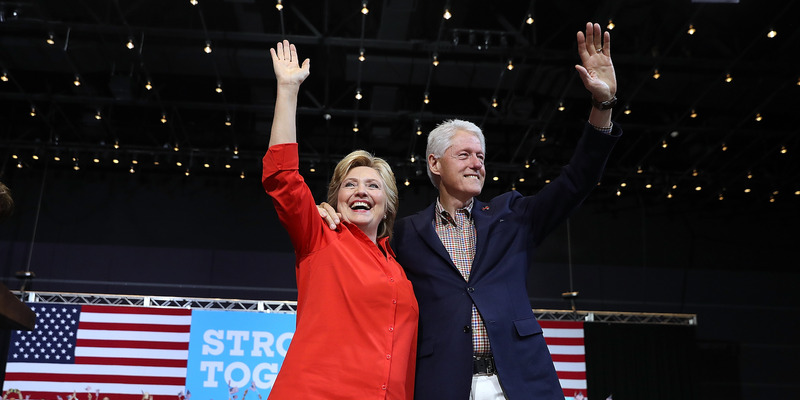 Some argue that while the Clintons are adept fundraisers, the mixed perceptions of them among the party and their decades of political baggage are hurting Democrats. A former aide to the 2016 Democratic presidential nominee, Hillary Clinton, said there was a “not zero” chance she could throw her hat in the ring a third time in 2020. Philippe Reines, Clinton’s former senior adviser and deputy secretary of state for strategic communications, told Politico in an interview published Friday that just because Clinton had lost twice before didn’t mean she should be counted out for 2020. “It’s curious why Hillary Clinton’s name isn’t in the mix – either conversationally or in formal polling – as a 2020 candidate,” he said. After mostly staying out of the political fray since her 2016 loss, Clinton has become more active on social media and is reaching out to White House reporters to repair her contentious relationship with the press, according to Politico. She is also set to kick off a speaking tour with her husband. But some Democrats see Clinton’s reemergence on the political stage as a nuisance rather than a boon for the party. They say that the Clintons’ complicated legacy and combined political baggage have polarised many in the party and made them easy targets for Republican attacks. Clinton raised eyebrows in a recent interview with CBS when she said her husband’s affair with Monica Lewinsky while she was a White House intern was not an abuse of power, prompting ire from fellow Democrats who said she distracted from the party’s midterm message. But Reines said Clinton’s fundraising prowess and decades of experience fighting tough battles shouldn’t be taken for granted.